In 2007, Amazon announced their music store. It would, they promised, deliver DRM-free music to U.S. Amazon users. And they did just that. With much fanfare, they rolled out Amazon MP3, touting music downloads for any device. On their website, they explain what's special about their music sales. "DRM-free means that the MP3 files you purchase from Amazon.com do not contain any software that will restrict your use of the file." "I'm a student from University of Calabria (Unical) , Cosenza Italy. I write you because for the journey against drm on 4 May we (students) have done a small event to raise the academic world to the problem of DRM and I've sent you link of pictures of it (with a very large delay!)." Kindles and iPads are making their way into classrooms across the world. Schools like Seton Hill and George Fox are giving iPads to incoming students. Monte Vista Christian School, in California, has sixty of them that are now in the hands of advanced placement students. Once again, we're seeing boneheaded reactions to the failure of a DRM scheme. DRM is largely ineffective against large-scale unauthorized copying going on in Eastern Europe and Asia, and yet the large media companies are happy to parade the opposite as the truth. Instead of admitting their real goal of disrupting legitimate uses and restricting customers as much as possible — forcing them to repeatedly purchase the same records, movies and TV shows again and again — they pretend that this is technological progress. Apple has a long history of imposing innovative restrictions on its users. The Digital Restrictions Management (DRM) used in the iPhone to prevent users from installing what they want or tinkering with their devices are well-known examples. Yet not so many people expected their latest move in that direction -- Apple's recent patent application on a new spying technology revealed their plan to dedicate users' devices to their unlimited control. college for the first time. students in lieu of textbooks and other materials. Throughout the relatively short history of Digital Restrictions Management, we have seen various methods of user restriction come and go. Now, there is a new threat on the horizon: UltraViolet. A soon to be implemented DRM scheme, UltraViolet -- or should that be Ultraviolent -- is a joint effort between companies such as Sony, Adobe, Cisco, HP, Microsoft and Intel. We now have an official winner of our sticker design contest announced in April. Our old stickers depicting the shackles of DRM went well with Apple's iPod advertising at the time, but now, with Apple's new developer licensing agreement and the release of the iBad, their latest restriction, our anti-DRM sticker is in need of an update. Design a new Defective by Design sticker! With the iBad, Apple's latest restriction now released, and the recent furor over their new developer licensing agreement, it occurred to me that our sticker needed an update. Read more about Design a new Defective by Design sticker! 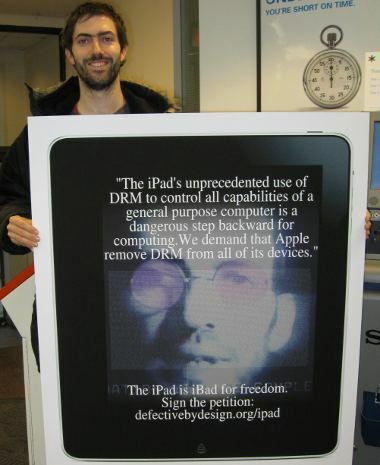 Last week we topped 10,000 signatures on Defective by Design's iPad petition, and mailed the second batch of 5,000 signatures to Steve Jobs on our own giant tablet. 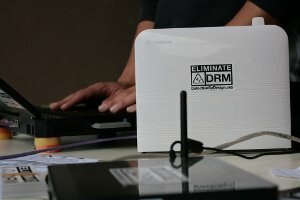 Day Against DRM: Sign-up Now to Help the Effort! 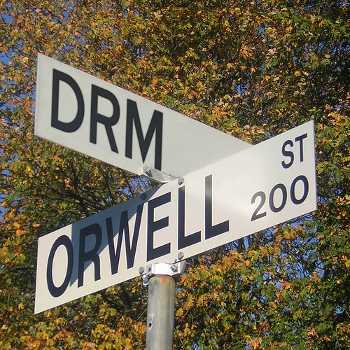 Tuesday May 4, 2010 will be the international Day Against DRM. The FSF will be working with other anti-DRM groups and anti-DRM activists from all over the world to raise awareness and mobilize the public. So spread the word by sharing this announcement, and putting the buttons below on your site. Get ready for the action by signing up here. Read more about Day Against DRM: Sign-up Now to Help the Effort! Many of you have written to us about Ubisoft's outrageous form of DRM, where players have to be constantly connected to the Internet in order to play the company's games -- not because the games are multiplayer, but for the sole purpose of the company being able to authenticate and keep an eye on you. Well, everyone who purchased the games using this system became painfully aware of this deliberate defect yesterday. Defective by Design has presented its petition to Jeff Bezos and Amazon, demanding that Amazon remove Digital Restrictions Management (DRM) from all their products. Since the petition launched, Amazon has taken two small steps away from total DRM-enforced control. First, their publishing platform changed to make it easier for publishers to submit DRM-free PDFs. Second, a proprietary firmware update allowed Amazon's "Swindles" to read DRM-free PDFs that were not downloaded from Amazon. Since the late 1990s, a handful of media and technology companies has waged war against the public, imposing digital restrictions on the technology we use.. Here is Defective by Design's look at some of the most significant events in the past 10 years fighting against DRM. If there are important moments missing (which there may be), please send them to us! Despite a number of victories over DRM in specific areas, DRM is far from dead. Whether companies will control and restrict us through our technology remains to be decided, and the battle is now. The response to our iPad protest and petition has been tremendous: 5,000 people signed in the first 24 hours, with coverage in the technical press, Digg, Slashdot, Reddit, The Guardian, NPR, and more. Today, Apple launched a computer that will never belong to its owner. Apple will use Digital Restrictions Management (DRM) to gain total veto power over the applications you use and the media you can view. We've launched a petition calling out Apple's new product for what it is: a frightening step backward for computing and for media distribution. Can you read it, sign it, and share with friends? Update 2010-01-25: We will be meeting outside the Theater at 8:30am (Wednesday 27th), and will go until at least 10:30am. 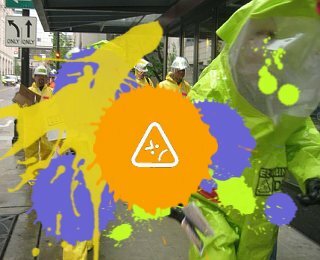 Stay tuned to http://identi.ca/dbd for updates and coordination. This coming Wednesday, January 27th, Apple has invited members of the media to San Francisco's Yerba Buena Center for the Arts Theater to "Come see our latest creation." There has been much speculation about what Apple will be announcing, with most of it revolving around a possible tablet PC -- basically an oversized iPhone. But no matter the form factor, it's all but certain given the direction Apple has been going that any new product will be DRM-infected and restricted by proprietary software. The company who once announced to the world that they opposed DRM on music has been pushing DRM in every other area of their business. Apple's iPhone goes out of its way to apply DRM on every piece of software on the device, saying it is illegal for users to install software that comes from anywhere other than the official Application Store. Can you imagine a world where this same restriction is applied to your laptop or tablet PC? That could very well be Apple's announcement on Wednesday -- their latest restriction. As in the past, they didn't invite us to the event, but we thought we would go anyway, and bring some friends. We'll be there to warn the public and the media outside the event about Apple's support for DRM and proprietary software. Come help create the counter story in the media -- take photos, talk to the press, and have fun with a little bit of theater to show that Apple is not the force for creative expression they claim to be. 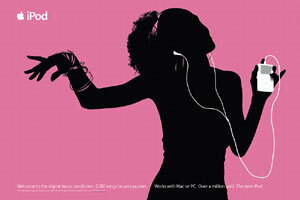 We got through to Steve Jobs before on music DRM, and convinced iTunes to drop it. We know we can have success here. But we need to repeat that effort and show that DRM on Apple computers means that people who are actually interested in creativity and freedom will go elsewhere. Press coverage of Apple events usually falls all over itself to praise the style and sleekness of their devices. It's vital that we be there to unmask the new product for what it undoubtedly will be -- another seamless case and pretty screen hiding a new set of restrictions and threats to the public's digital freedom. We'll post the precise time and meeting location for our group here next week -- since Apple's event starts at 10am, attendees will be showing up at 9am, and we will want to be ready and outside the Theater by then to hand out flyers and talk to people. I'll be there representing the FSF and coordinating the action. Please join us, and bring friends. Let us know you're coming at info@defectivebydesign.org. We'll meet at 8:30am outside the Theater. We're at a crucial moment in the fight against DRM. This year--thanks to the strength of the movement you've built and been a part of--we defeated DRM on music. But DRM on books, games, and other digital media is a bigger threat than ever. DRM free? Really? You’re not just pulling my leg? AJ: No, really, DRM free! The MPAA is pressuring the FCC for the authority to cripple recording devices using so-called "Selectable Output Control" (SOC). Slashdot reported over the weekend that Lulu, the print-on-demand service founded by Red Hat's Bob Young that has been an important resource for DRM-free and pro-sharing authors, is now selling DRM-infected ebooks. The video game "Borderlands" was released for consoles on October 20. But when people who bought the PC version in stores went home to play it, they had a nasty surprise. Thanks to DRM, they couldn't install it until the official release date 6 days later. Hi, I'm Sarah Adelaida and I am working at the FSF this summer as part of a newly launched internship program. I will be posting new DRM news each week. If you'd like to know more about me read my letter of introduction. If you see stories we should mention here, please let me know. Apple's lawyers, led by David L. Hayes of Fenwick & West LLP, claimed in comments submitted to the US Copyright Office that the Digital Restrictions Management (DRM) system on the iPhone is necessary to combat drug dealers, safeguard the cell phone network, and prevent you from hurting yourself. Update: hundreds of 1-star reviews added to Kindle page! This week's Kindle action is going great; together we've generated hundreds of 1-star reviews and tags. Then there was a great article in Slate by Farhad Manjoo, Amazon's top "expert reviewer" on the Kindle's product page, retracting his recommendation. This would be a perfect article to share with friends and co-workers, to introduce them to the problem of DRM (diggable here). If you haven't written a review yet, here are direct links to the review forms. Take a few minutes to explain to potential Kindle buyers why they shouldn't get one: 6" Kindle, Kindle DX. If your review wasn't published by Amazon, definitely let us know. We'll be busy picking our next product to target (if you have any suggestions, email us at info@defectivebydesign.org). In the meantime, we thought we'd share some of our favorite reviews below. Awesome job, everyone. Read more about Update: hundreds of 1-star reviews added to Kindle page!